How to reach Rome's cruise port from Leonardo da Vinci Airport (FCO) by public transportation. 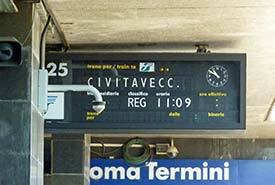 ABOVE: If you're traveling between Leonardo da Vinci (Fiumicino) Airport and Civitavecchia by rail, you'll need to change trains at Rome's Termini Station. Fiumicino - Roma Termini (using either a commuter train or the faster and more expensive Leonardo Express). Roma Termini - Civitavecchia (using either a commuter train or a long-distance train that stops in Civitavecchia on its way to other cities). Train fares are reasonable (especially if you skip the Leonardo Express and use commuter or other second-class trains), but the journey can take two to three hours with the connection at Termini Station in Rome. If you're pressed for time, or if you're traveling with excessive luggage, you may want to consider splurging on a coach transfer from your cruise line or a private car transfer between the airport and cruise port. For articles about Civitavecchia and its cruise port, please go go our Civitavecchia (Port of Rome) index page.